It’s coming up Daylight Saving Time again on Sunday. 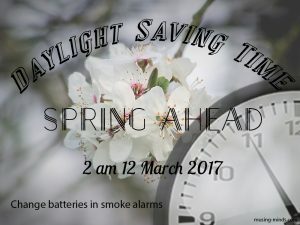 Time again to set the clocks ahead with the spring and mess with our internal clocks once again. Puerto Rico, Hawaii, and Arizona don’t mess with this and neither should the rest of the country. Livestock doesn’t go by clocks. Pets don’t go by clocks. And their feeding times will get all discombobulated. We should just stick with regular time and leave it that way.